One of the things Andy Warhol was known for was creating silkscreens based on photographs of celebrities and everyday objects. Check out some of his stuff here. Take some pictures of subjects that you think might work well for this assignment. The difficult part is finding an image that has enough detail left to color after you convert it with the threshold adjustment. Go to IMAGE>ADJUSTMENTS>THRESHOLD. Drag slider to taste (how you think it looks best). Now your picture is just black and white, no grays. Try a few different pictures. You can also do this conversion in sections. Select an area with the selection tool, do the threshold adjustment, select another area, do the threshold adjustment, etc. until is is all converted. I'll show you how to do this in class, it is easier than it sounds. Once you have a good black and white image, make a new layer above it, drag your selection tool (polygonal or regular lasso tool) around the area you want to color. This doesn't need to be exact. Fill the selection with a color (choose the foreground color, EDIT>FILL>FOREGROUND COLOR) and then change the layer blend mode to multiply (experiment with other blend modes). You should then see the black under the color. Make a new layer for each color. After you are done adjust the colors so they work well together. To change a color: select the layer. go to IMAGE>ADJUSTMENTS>HUE/SATURATION and drag the hue slider to change the hue. Also experiment with the saturation and lightness controls. After you have created one file, duplicate that three times. With the three additional files, highlight each color layer and go to IMAGE>ADJUSTMENTS>HUE/SATURATION to change the color. The object is to create an image like the one to the left. I'll show you how to combine the four images in class. Note: this can be a new image or an old image taken this semester. 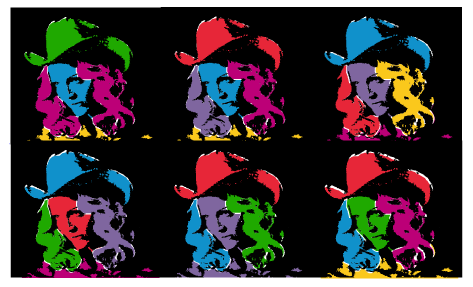 Click on image to right to go to website to build your own colored Warhol silkscreen with the images provided. You can capture your result with a screen capture (Command-Shift-4). Click Here to see Andy Warhol creating silkscreen prints.